The dress is blue and black but the photo of the dress is not. I don’t care what color the dress is. Instead, let’s focus on the three questions around this Internet tempest in a teapot that actually are intriguing. What caused the camera take such a weirdly inaccurate photo? Why is the human perceptual system causing this image to be perceived differently by some people? Was one side’s perception of the color more ‘correct’ than the others (spoiler: Yes, and I’ll prove it). By way of full disclosure, I mostly see the dress as goldish tan and very light blue. However, I am ambi-dress-trous. With some effort, I can force myself to see it as blue/black as well. Below, I’ll show you how you may be able to trick your brain into the seeing it the other way too. First, a few facts. Secondary photos show that the physical dress is, in reality, blue/black. However, this proves nothing about what the original inaccurate photo of the dress shows. A photo of the dress is not the dress, so knowing the true color of the dress doesn’t change what the original untrue photo shows. The color cues in the photo are unintentionally deceptive. How your visual system interprets these cues leads to the difference in perception of colors. The Photoshop color picker demonstrates that the original, inaccurate photo shows the dress colors to be a very light bluish hue and a goldish brown which fades to tan. This brings us to the first question: what caused the camera to take a this photo with inaccurate colors? When a camera takes a photo it tries to determine the correct white balance for the scene. In other words, it has to decide what is true white. It also has to decide what is true black in the photo. To do this the camera scans the image and looks for the whitest white and the blackest black and adjusts the rest of the colors accordingly. This is called “White Balancing.” It usually works quite well but we’ve all seen it fail occasionally in photos when skin tones look blue. So what caused the camera’s color interpretation error in the original photo? I don’t think it’s a white balance error, I think it’s an exposure error. Why? Because there are three white reference sources in the image and the camera kept them all white. 1. At the top right of the image, behind the dress, is what appears to be daylight coming from a window. We can tell it’s daylight because of the blue halo glow around the top right of the image. That’s called chromatic aberration and it often comes from daylight, so it’s proper to infer we’re seeing through a window to outdoors. 2. Closer to the camera is what appears to be a store display cabinet with internal lighting. 3. The store’s interior ceiling lights which are illuminating the white-to-beige gradient on the floor. These appear to be halogen lights, due to the slightly warmer hue of the light. I’d just asked my five year old daughter to take a listen to some new speakers I’d installed. It was a 2.1 stereo system with subwoofer and integrated amplifier, all for less than $80 delivered. The reviews on Amazon offered a lot of praise about the sound quality despite the low price. Once hooked up I was surprised how good they sounded on a reference audio source. Especially for their diminutive size and low price. At that moment my daughter had bounced into the room and I wanted to share the experience of being so pleasantly surprised by a new product. And that was where things went off the rails. As the impressive sound flowed around us and she stared blankly back at me, I realized “She doesn’t even know what bad audio sounds like. To her, great sounding audio is just audio.” Kids under a certain age simply don’t experience crappy sound often, or perhaps at all. To them, audio reproduction is either ‘great’ or ‘broken’, there is no middle-ground of ‘everyday bad sound’. When I was a teenager, bad audio was pretty much the expected default. Most places we went generally had lousy audio, except perhaps a concert, a theater or an audiophile’s house. The bad sound wasn’t just from terrible speaker design, it was also from substandard materials, poor placement and abysmal audio sources. Whether it was the snap, crackle, pop of an LP on my dad’s $500 turntable, the smeary, muddled sonic mess created by an audio cassette, or the incessant background hum on my cousin’s vintage dashboard 8 track player, it just sounded bad. But it was the kind of bad we were used to. I did a quick mental rundown of the persistent audio sources in my daughter’s life. She watches a little bit of TV in the living room which has a 5.1 Dolby Digital sound system. Our home theater has a THX certified 7.1 system. The sound systems in our cars are standard manufacturer equipment, which these days sound quite good. She even has a pair of Bose noise cancelling headphones for her iPad. The sources feeding into these systems are all at least 44.1 Khz, 16-bit digital recordings compressed with recent generation codecs. Kids these days simply have no experience with how bad a fuzzily modulated sound source over-driving cheap speakers can sound. Yes, I just said “Kids these days” but I’m not devolving into a rant of “In MY day we used to have to…” It’s actually a nice reminder just how far the march of progress has carried us in an area we don’t think about as much as ‘modern wonders’ like computers and mobile phones. Even setting aside the impact of digitization of sound sources, over the past couple decades the typical quality of sound reproduction per dollar has scaled up dramatically. Although sound design used to be largely a black art, the knowledge of how to engineer low-cost speakers and amplifiers at high quality has become ubiquitous. The cost of components and materials has fallen to the point that even ‘cheap’ gear sounds remarkably good and ‘cost effective’ gear can sound amazing. There’s little additional value in paying top dollar for audiophile-grade equipment. The improvement over well-chosen mainstream gear is negligible. Audio purists used to pay $1,000 and up per speaker. Today, entire 7.1 speaker systems with outstanding quality cost less than $1,000 total. And that’s pretty awesome. I was thinking about branding and had a realization. Good brands tell you who they are, great brands tell you who you are. Is Your New Idea a Feature, a Product or a Business? When I talk to young entrepreneurs I’m always impressed by the enthusiasm and passion they have for their new business ideas. While I want them to be excited, I also want them to succeed in the long-term. Unfortunately, excitement doesn’t always map to success. There are two questions that should be asked of any idea before an entrepreneur unleashes their enthusiasm. First, “Can this idea disrupt the status quo?” If it’s not going to disrupt someone’s existing business, the idea may not be valuable enough to drive a successful new business. The second question is “Will this be a feature, a product or a business?” This is about defining scope. Many interesting ideas are really new features for existing products. The risk is whether these features generate enough value to differentiate an entire product. When considered in isolation, these cool features can appear monumental. However, when seen from the context of busy customers who are difficult to reach and resistant to changing what works, it’s clear the value on offer must reach epic proportions. It’s better to focus on an entire new product experience. Many new products replicate some existing product functionality but the most successful products redefine the overall experience to such an extent they create a new category. Yet, even this is not always enough. If this new product is successful, are there adjacent problems and customers to drive a string of hit products? One successful product can be the basis of a new venture but successful entrepreneurs think about building businesses not just products. You said something that touches on a struggle I’ve had my whole life. I’m hoping you could offer some advice. The gist was “There’s nothing more dangerous than an entrepreneur with just one idea.” I’ve got the opposite problem entirely. I have real difficulty not working on an idea, and I latch on to a lot of ideas at once. The result is pretty predictable – if I was doing this on a workbench, there would be a dozen things that are about 1/3rd built. I know intellectually that it doesn’t work that way – that seeing things through is the important bit, that keeping focused is key if you want to build success, and that you aren’t doing wrong by your ideas by not spending energy there – that you take focus from one idea in service of another. I think I get it, in my brain at least. But I’m lousy at putting that into practice. It’s really easy for a novel idea to catch my passions and I have a really hard time putting that idea in the book and coming back to it later. Short of hiring someone I could hand my half-solved puzzles to so I could half-solve a new one, do you have anything you can offer me here? This is a standard problem for creative people. One solution is enforcing a more granular workflow. Any time you contemplate “starting” something, you should set a clearly defined “stop” point. That doesn’t mean it’s stopped forever, just that you are stopping for now. You need to define one unit or increment of work with a clear end state that will allow you to move on. This increment or unit should be short. Don’t start anything else until you’ve reached the stopping point, hence the short duration. Having a bunch of projects all simultaneously in mid-flight is draining and task switching will eat time. Redefine each “flight” as a much shorter hop. Then you can leave one idea conceptually in the hanger and avoid going insane trying to simultaneously pilot all of them. 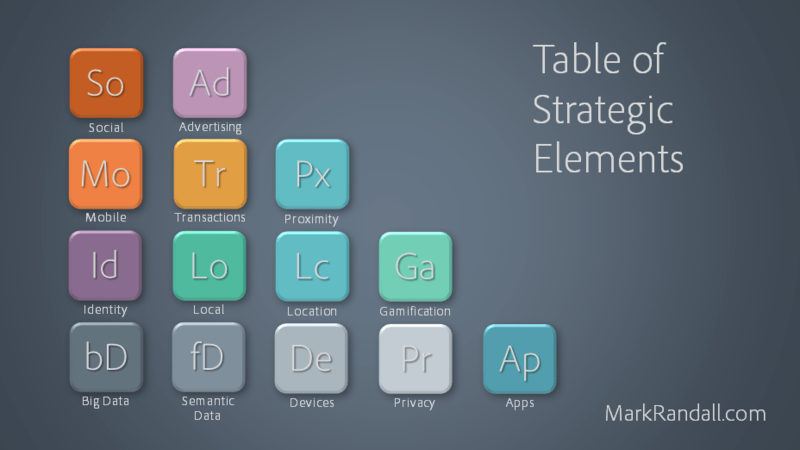 By popular demand, here is the Table of Strategic Elements slide from my keynote at The Next Web conference in Amsterdam. You can subscribe to updates of this table and other posts in the sidebar. If you remix this table with new categories or layouts, I’d enjoy seeing it. Hypothetically, there are two customer segments we are considering targeting for new product development. We haven’t really started searching for the product idea yet. First we’d like to decide which segment we’d prefer. Let’s suppose one customer segment is a small, hard to reach market that doesn’t have much money and the other customer segment is a huge market with deep pockets that’s easy to reach. Now imagine the product solution we eventually come up with for the smaller market revolutionizes the world of that customer but the best product idea we can come up with for the bigger market is just a so-so, nice-to-have. Canon made a “brilliant mistake” with their 5D mkII camera unleashing a profitable market disruption. Now they’ve released the 5D mkIII and, unfortunately, they’ve “fixed” that mistake instead of building on it. Canon could learn a thing or two from Intel. Note: This my personal opinion and unrelated to my employer’s views. I’ve always loved Canon’s consumer DSLRs cameras, starting with the digital Rebel, arguably the first truly ‘consumer’ DSLR because it was priced under $1,000. 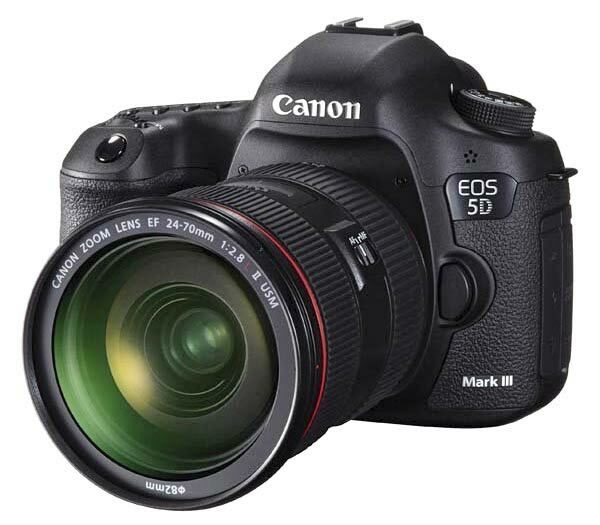 Three and a half years ago Canon launched the 5D mkII, a new flagship camera in their mid-high end professional line. It sold for about $3,000 or nearly $4,000 with an included lens. Normally I would never have noticed this kind of camera. I was happy with the price and performance of cheaper DSLRs. But a few months after release the 5D mkII started generating a lot of buzz from video shooters and indie filmmakers. The camera included a video mode that was rather primitive but the camera’s still photography strengths, including the large 35mm imaging chip, low-light performance and high-quality interchangeable lenses made the imperfect video mode capable of some truly sensational results. You had to crawl over some pretty big flaws to get those results but there had never been anything like it anywhere near the 5D’s price point. Ever wonder why Amazon can’t offer a cheaper bundle including print, audio & e-book versions? Is it accountants vs. book lovers? Amazon is good at figuring out what we want before we even know it. That’s why I like the company. So it stands out when they miss an opportunity. I buy a lot of books from Amazon. I also buy audiobooks from their Audible division which I listen to while driving. Sometimes I’m torn between buying the printed version of the book, an e-book or an audiobook. They are all ideally suited for different things. When actually reading, I prefer a printed book if it’s a title I think I’ll want to keep, refer to or possibly loan out. If it’s typical Tom Clancy long-flight fodder, then I prefer it as an e-book since longevity, shelveability and loanability are trumped by portability. If I have some drive time coming up, I’ll want to go for the audiobook. A third grade teacher noticed it first. She complained "Mark is a disruptive influence". As we each grow up, many traits change.